For a text that I am writing, I have been digging around in OECD.Stat, since there are lots of interesting statistics on unit labour costs (ULC). The text, in part, analyses the sectoral changes in ULC in Finland. Unit labour costs (ULCs) measure the average cost of labour per unit of output. They are calculated as the ratio of total labour costs to real output. It is clear that Finnish ULC dropped because of the sudden drop in GDP from 2007-2008, NOT because of outrageous wage increase in 2007-2009. In fact, those alleged big wage increases are not really visible here – until 2012 the graph shows a quite steady increase in labour compensation per employed persion; it is possible to say that the average rate of growth has not changes very dramatically. GDP, on the other hand, has changed dramatically, and although the labour compensation has flattened since 2012, the GDP has declined more/flattened more. That is the nearly 4 year stagnation that we have experienced in Finland. 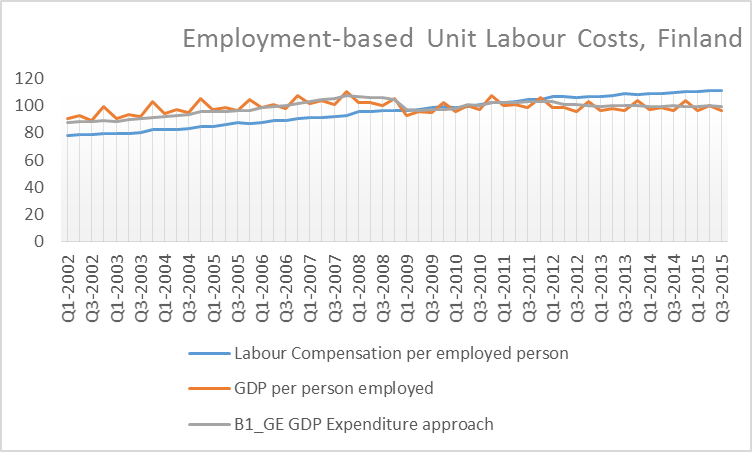 ULC has obviously declined as matter of statistical fact, but from the graph it is quite clear to see how much labour compensation would have to change to restore ULC to the pre-2007 level. 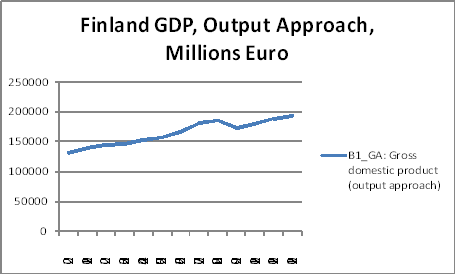 And although I do not have the means to simulate this, such a decline in labour compensation would almost certainly have a very negative impact on the GDP (as I have argued before, the Finnish economy was kept afloat through domestic demand. Not anymore!). So I do understand the worries of Finnish business life about “competitiveness”. For individual firms the combination of stagnant economy and rising labour compensation is toxic. But the point is simply that ULC is in no way a suitable measure of competitiveness! And, beyond that, there is an argument to made (as Knibbe (2013) does, that ULC should increase, given the ECB’s inflation target. – iIn particular given that in Finland producer prices have been sliding since 2012 and that there are not many upwards pressure on the Finnish CPI . Where politicians talk about structural reform (and mean wage decreases) I think Finland needs structural reform of its industrial base. Looking for new markets. Innovating. Moving into selling more high-value added products. Of course, in a developed country like Finland it is clear that the domestic market has a large impact on GDP, more so than exports, but it certainly doesn’t hurt to use Finland’s high-tech potential more! In any case it should be long due that politicians acknowledge that wages are not the issue here (or only a minor issue). The big issue is still European and world demand. In recent days there have been commentators speaking about Finland missing the last legs of the growth cycle. They may be right, but also then Finland has to reconsider deep and hard what it sells, and especially HOW. This a very important post which makes the point (yet again) that the whole disaster of the Eurocrisis would have been far less extreme than it is if Germany had played by the rules. Thanks to this strategic analysis of Greece, I have learnt to use a new (for me) statistics database – OECD.Stat and more specifically the STAN database. 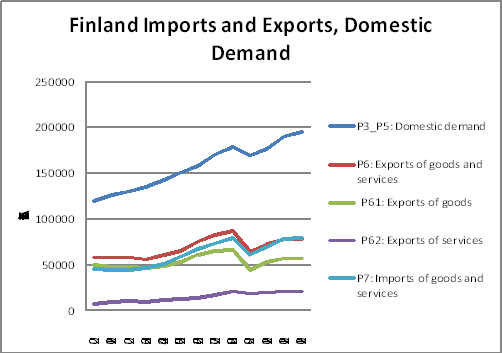 I started wondering how the same graphs look for Finland that Papadimitriou et al produce for Greece. Obviously, the data is only until 2012 (or 2009), and according to all kinds of sources the Finnish economy has definitely soured. As you can see, there is a decline in GDP in 2008-2009, just like in most parts of the Western world. And also here, GDP continued growing, but at a lower level than before 2008, suggesting that also in Finland there is an output gap. But what is the export of Finland? There is/was Nokia, there are successful companies like Kone and METSO (at least regarding the mining machinery division), chemical companies, smaller companies like Fiskars (of the scissors and knives). The OECD STAN database has a separation of export of goods by technological content. You can see this for Finland below. Compared to the study on Greece, I left out agriculture and ICT manufactures; the latter is included in the high-tech exports, as far as I could see from the database. 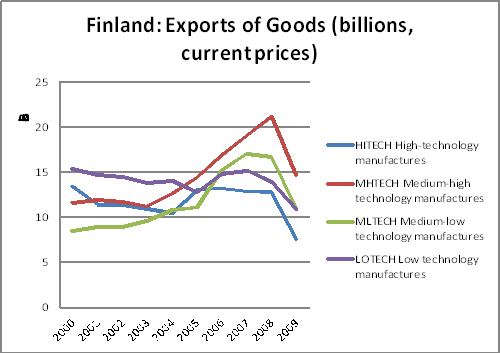 So even though Nokia and other ICT manufacture has always been seen as a major factor in Finnish exports, in terms of value this did not show. The category with the highest growth until 2008 was the Medium-high tech manufacture, as well as the medium-low technology manufacture. Companies like Kone and METSO as well as chemical industry fit the bill for medium-high technology manufacture (all these categories are based on R&D intensity). The decline in low technology manufacture is perhaps best expressed by the decline of the traditional pulp and paper industry in Finland. It is a shame the dataset ends in 2009 (due to changes in categorization valid from 2010). What does this look like for imports? 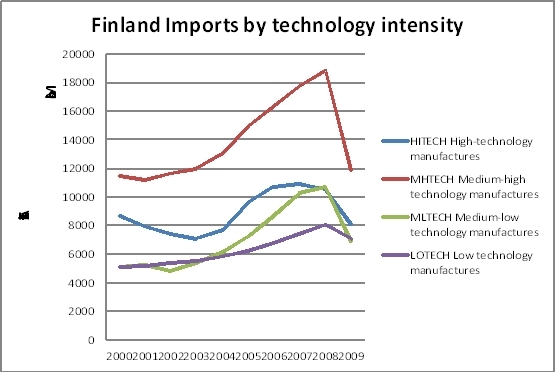 Most of Finland’s imports were in the category medium-high technology manufactures. This category also has seen the sharpest drop. The other import categories are surprisingly close to each other in terms of value. So the bottom line regarding the trade balance might be: both imports and exports fell starting 2008, but most of the decline seems to relate to the medium-high technology manufacture. As a final statement I would like to say that from these statements it really seems that the focus on international competitiveness is a bit overblown. Yes, exports are important and there are very many top quality manufacturers in Finland. But in the current situation, with European and global demand weak (and perhaps getting weaker again), it seems that it is more important to bolster domestic demand. This means more than wage moderation – because demand isn’t going to come back with that. So my personal advice for the current labour market negotiations is: focus on domestic demand and purchasing power, not primarily on international competitiveness. There are many more people working in non-export sectors than in the export-sectors and it is high time taking their purchasing power into account; however illogical that may seem to those steeped in neoliberal competitive markets-thought.